Today I will be reviewing the Copper/Black Steampunk Mod Clone from AngelCigs. The first impressions of the Steampunk Mod Clone is that it’s one of the most beautiful mods I’ve ever laid my eyes upon, and my final impressions of its appearance hasn’t changed one bit. 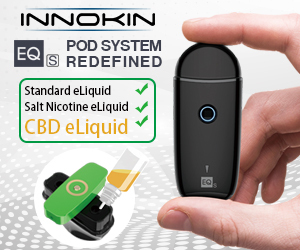 At ever detailed inspection of the device leave the same results; that it’s stunning, brilliant and truly an art peice of a device that will turn heads and draw crowds. When I first started using the Steampunk, I would catch myself looking down at it in amazement, but that “new” feeling doesn’t let up and I continue to find myself looking at it with the same thought. 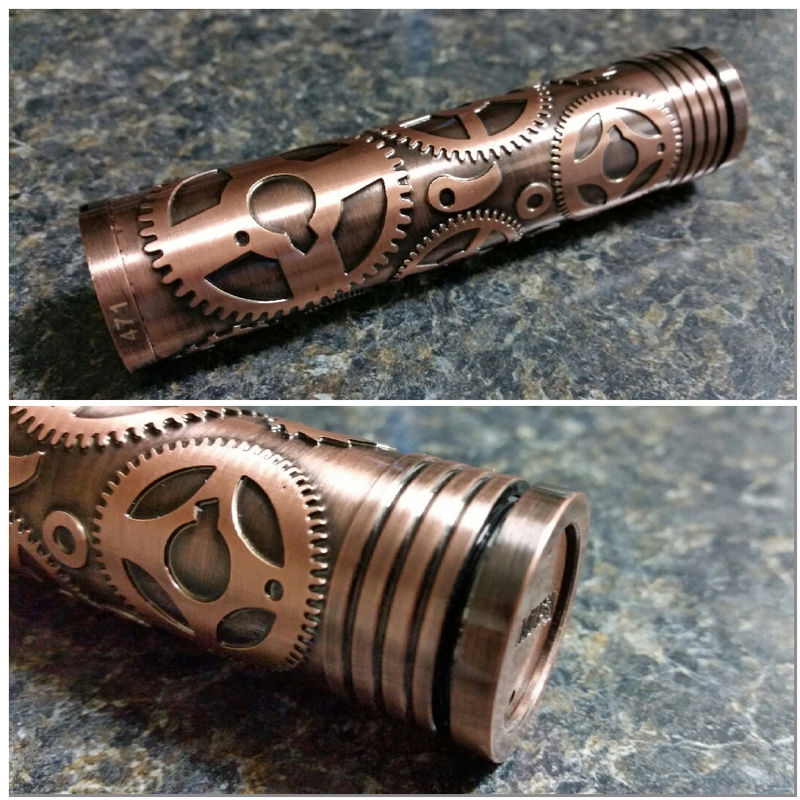 This particular Steampunk Mod I have is the Copper and Black version. The device itself is copper, but each of its fancy gears that give it the Steampunk look is outlined with a black color. A clear gloss finish has been covered over the entire device to prevent the device from discoloring and keeps the device looking just as it has from the first day it was created. 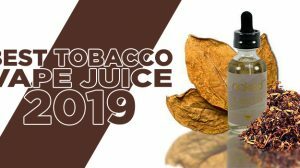 At the top of the device are slits cutout for airflow and any leakage of e-liquid that may occur (thought I feel we’re not plagued with that problem like back in the day). Throughout the body there are gears and shapes that give this device that “steampunk” appearance. There’s an etched number towards the top of the device that says the number “51” and I’m sure that is printed throughout all of these clones. Towards the bottom of the steampunk, there are 4 lines that circle the device’s lower portion, and the look flows well with the end locking cap. 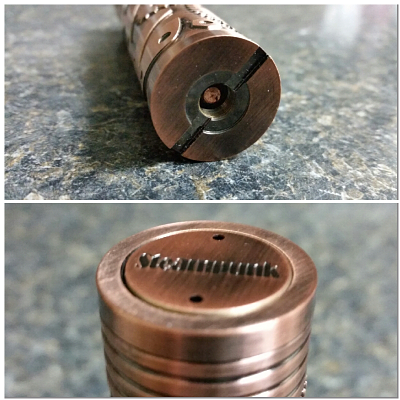 Underneath the device is a copper button with “Steampunk” etched, while 2 vent holes rest above and below it. 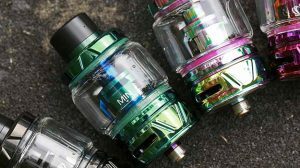 Besides the two slits at the top of the device, its copper top center pin, the easily adjustable post, its very friendly locking switch and its perfect button, there isn’t a lot to say about the device… that is until you actually take it apart. The threads are beautiful and though they don’t quite have the butter feel, they are certainly smooth. In addition, the button felt real nice and there isn’t much to press when using this device, especially since a lot of the button length can be tucked away into the locking ring, so I had to pull all of this apart to confirm that smooth feel was indeed magnets. After twisting the button with my hands open to catch a spring or parts, it was confirmed, the button on the Steampunk is magnetic and that’s why the feel of using the device was better than I expected. Quick Note: This device is very solid and has a bit of weight to it. Luckily, there was no over spray of the clear coat on the threads, so all of my atomizers made a perfect connection. The center post can only go up so far, so when I used the Kayfun Lite Plus on this device, I was thinking it wouldn’t quite reach, but it did and vaped phenomenal. 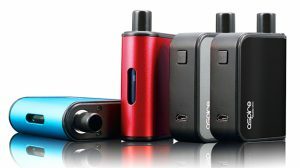 I’ve also used the TOBH Atty, which gave a great vape as well. 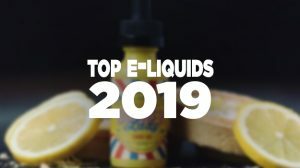 Much like most of the devices I use, the Steampunk didn’t fall short with my atomizers, and created clouds as expected with all of my setups I put to it. It performs well, and as expected, so there are no complaints here.